The following by Mary Strachan Scriver is about Robert Scriver, known to many as one of the more prominent Cowboy Artists in America. Bob earned a master’s degree from Vandercook School of Music and did post graduate work at the University of Washington and Northwestern University. He severed in WWII, afterwards settling in Browning, Montana, where he opened a Taxidermy business. He did not start his life as a sculptor until age forty-six. During his long career, he created more than 1,000 sculptures and wrote and published several books. 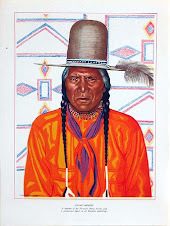 His work is displayed in art galleries and museums through out America and the American West. Emerson remarked that history is biography; without the history of individuals, there could be no history of things or events. This is certainly true of the noted Western sculptor, Bob Scriver (1914 - 1999), whose life spanned most of the twentieth century, but was grounded in the rich history of nineteenth century America. 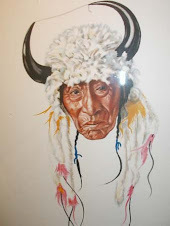 Born and buried on the Blackfoot Reservation in Montana, his life could not help but to be entwined with the history of the Blackfoot people and the artists who found their way to the Blackfeet Reservation. 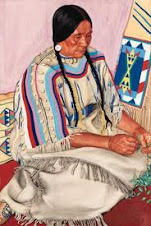 In Montana Charlie Russell (1864 - 1926) dominates all conversation about Western art, but Bob Scriver did not create sculpture like Charlie’s. Bob’s work had far more to do with the Paris-educated monumental sculptors who are nearly forgotten today: Augustus Saint Gaudens, Daniel Chester French, James Earle Fraser and his wife Laura, Lorado Taft, the Borglum brothers (Gutzon and Solon). We do remember their work: the seated Lincoln in the Lincoln Memorial, “End of the Trail,” Mount Rushmore, and so on. But how does a kid in the dusty, windy little reservation town of Browning, Montana, even find out that such sculptures exist? Sculpture was actually Bob Scriver’s second career. His first chosen profession was that of band leader and teacher. But when Bob went off to Vandercook School of Music in Chicago with his cornet under his arm, he discovered Malvina Hoffman (1887 - 1966) at the Field Museum and fell in love with her work. He also became aware of the monuments of WWI and the Civil War pictured in the newspapers that announced their dedications in the early decades of the 1900’s. And perhaps also an influence was the beautiful French bronzes (Nudes!) owned by his wealthy aunt and uncle in Minneapolis. Regardless of what these influences might have had on Bob’s artistic endeavors, I always thought there might be something else. In the course of studying Bob’s youth, reading the early newspaper stories, I began to realize that 1928 -29 were important years in Browning. The Meriam Report had just been issued, a scathing revelation of government neglect and deception brought on by the Dawes Act, which broke up the communal ownership of reservation land, dividing the land into parcels and issuing them to tribal members. The idea was for the people to make a living from their land, but the east slope of the Rockies was totally unsuitable for small agriculture. As soon as the federal government issued the land, swindlers began to cheat individuals who didn’t understand the system or were in extreme need, and the government ignored -- may even have colluded with -- the cheating. Because of these practices, the Blackfeet were soon in dire straits. And adding to their burden, the Economic Depression that was just around the corner -- the stock market crashed in October, 1928. The whole country now suffered. Congress sent Senator Liggett to make an investigation of Blackfeet matters and his report was also searing. But, after his report, a new recognition of the Blackfeet was underway, starting with a movement to commemorate Peace by creating Waterton Peace Park, adjacent to Glacier National Park on the Alberta, Canada, side of the border. Also, there was considerable awareness that the 19th century culture of the Buffalo Hunters was about gone. General Hugh L Scott, whose part in the Plains Indian wars was leavened by his devotion to peace-making afterwards, came up with the idea of convening the last “Sign-talkers,” those who spoke the hand gesture language, to be filmed as a permanent record. This succeeded and the film (now a video) is a joy to see. In addition, the footprints of the signers were recorded in wet plaster. The Indians took their moccasins off, but Scott kept his boots on. These footprints were eventually cast in bronze and exist today in front of the Museum of the Plains Indian. In fact, the Museum of the Plains Indian grew out of a desire to have some kind of building or shelter with the circle of bronze imprints, though it took a decade for Richard Sanderville (Chief Bull) and others to raise the money. (Most of it came from Lions Clubs and the federal Indian Craft Board. This was the cultural environment in which Bob Scriver lived as a young boy. Added to this was the beginning of an art culture in Browning. In 1929, Adrien Voisin (1890 - 1979), a Beaux Arts-trained sculptor who was married to a white female sign-talker, came to Browning to make portrait busts of the old-time Blackfeet. 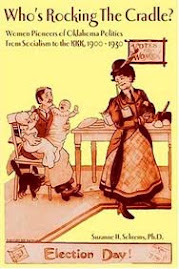 He shared a Browning studio with John Clarke (1881 -1970), a deaf-mute wood carver/sculptor, possibly making an alliance because Voisin’s wife used her signtalk experience at a school for deaf children and may have connected with Clarke that way. It seems likely that Voisin is the one who knew how to make footprints in plaster. 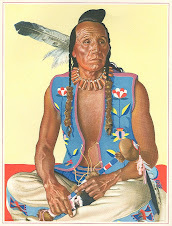 His busts include portraits of both John Clarke and Clarke’s mother, as well as other old chiefs, and are today in the collection of the Denver Art Museum. Looking at these dates and reflecting on the implications, it was as though I had a vision. John Clarke and Adrien Voisin in their studio in Browning would have been an irresistible magnet for two people: Charlie Beil (1894 - 1976) and Robert Scriver (1914 - 1999). Beil had led Russell’s horse in the 1926 funeral parade (riderless, boots turned backwards in the stirrups) and then helped Mrs. Russell in the confusion and moving to California afterwards. By 1928 he was living in East Glacier, working as a cowboy and showing off for tourists. Robert Scriver was fourteen years old, already first chair cornet in his high school band, but yearning also towards sculpture. I’m sure Beil and Scriver were often visitors to that studio, though no documents say so. In a yearbook photo dated that year, Robert looks young for his age. His high top shoes are scuffed, his hair falls across his forehead, and his bowtie is as lopsided as his smile. That was probably also the summer that Robert fell in love with his cousin and made a little riverbank clay portrait of Dayfly, the family pony, and Margaret, sitting in front of the horse “Lone Cowboy” style. He made a little wooden case so she could carry it back home with her to Montreal. In 1956 there was a state-wide contest for an heroic-sized portrait of Charles M. Russell to be placed in the Senate Rotunda in Washington, D.C. Bob Scriver entered it but lost. That was enough to start him on his career as a sculptor. One of the judges was Charlie Beil, who had forgotten all about that youngster called Robert, and they renewed their friendship which lasted until Beil’s death. By this time Beil had built a foundry in his backyard and was creating all the trophies for the Calgary Stampede. He helped Bob and me to develop the Bighorn Foundry in the Browning, Montana, backyard of the Scriver Museum of Montana Wildlife. The rest, as they say, “was history.” Scriver became a major sculptor, the maker of the heroic Lewis and Clark monuments in Great Falls and Fort Benton. 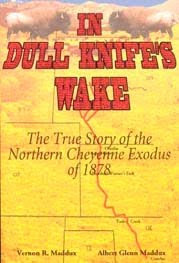 His works are now in Helena at the Montana Historical Society. Adrien Voisin had a hard time making a living through the Depression, so he turned to another skill acquired in Paris: interior design, which he developed into signature elaborate movie show houses. The one I knew as a child was in Portland, Oregon: the Egyptian Theatre where a double row of life-sized elephants stood high in the auditorium and an idol with a glowing jewel in its forehead sat in the lobby. When times got better, he moved to the California coast and rebuilt a ruin into a castle. Much younger than all these others, I am left to gather up the stories. It’s not a lonely task. John Clarke’s daughter, Joyce Clarke Turvey, also pursues the stories and photos of the not-so-distant past. She has a file folder of family letters between the Voisins and the Clarkes. I think I have the phone numbers of Charlie Beil’s children. Maybe it’s time to call them.